« OMG – Nice Weather – on a weekend?!? This morning, Jen and I went out for breakfast at Cherry’s Sunset Diner in Kresgeville, then for a ride up and around the Poconos and Lehigh Valley… with all the travel I’ve been doing this summer, it was great to finally get out on my custom Stratoliner / Jack-O’-Liner and just ride with no particular destination. 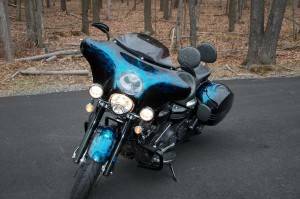 This entry was posted in Personal and tagged blog, family, motorcycle, software.